Project '49 started as most projects do, good intension's and a willing desire to "not go too far". This one started just that way, then things got out of hand. I bought a running 1949 Chevy and started to "tinker". Rebuild the inline 6 and clean it up, drive it and enjoy. Well then the windshield got busted (see below) and then the top was chopped. Well why stop there...9 years later I still have not finished it! One major factor in the delay is this my Teardrop Trailer which I took a year to build. It will be done, my goal is summer 2009!!! 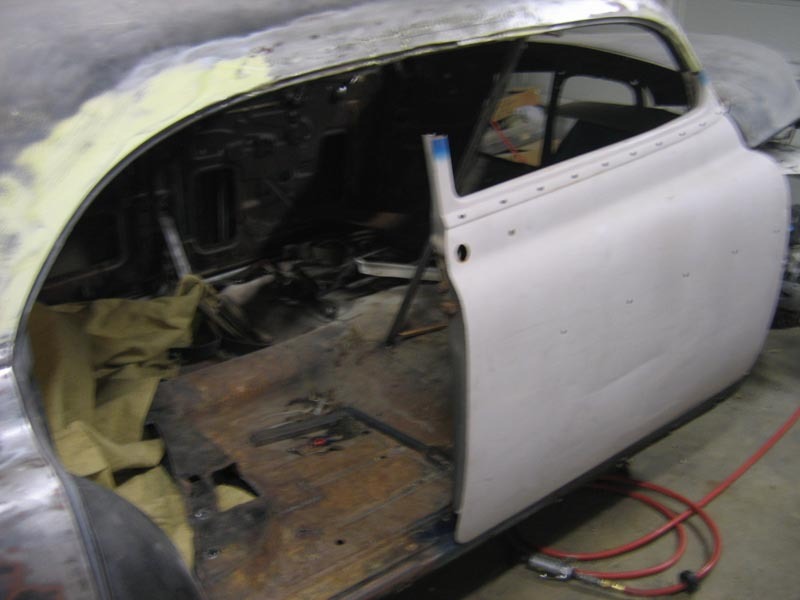 I was looking for a new project and set out to find a 1953 Chevy two door. This was before eBay and the ease of project searching. I looked high and low looked in the local paper's classifieds and found a running and registered 1949 Chevy. Ad said "must sell" so I figured why not go look at her. Well the wife went with me and when I get there I see it is a 4 door (bummer), well the wife says she likes it, a lot! Anyway I make the guy a really low $ offer and he accepts. So she is mine now! So the story goes like this ...I was driving one day and stopped for gas, checked the oil and started chatting with a fella about the '49. I close the hood (or so I thought) and on my way I went. I did not get far and then it happened, the hood flew open and crushed the windshield...Well I guess I will need to chop the top now...GRIN. 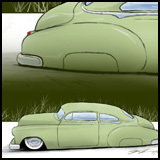 No way can I build a kustom and leave the factory 1949 technology underpinnings. So I bought a '86 S10 frame and took the front clip off and fit it to the '49s. Then the rear end was tossed and a 1970 Nova rear was fitted. I built a kustom triangulated suspension. The entire car rides on airbags. 4 to 2 door conversion. OK now it is a Kustom! I decided to convert the sled to a 2 door car. After chopping the top as a 4 door and doing all that extra work, I know this was foolish and yes it may have been easier and cheaper to buy a two door, but hay why not. So follow along as this process happens.